Last year, Hewlett-Packard or popularly known as HP released a new line of products designed to look stunning while packing a lot of punch regarding performance. One of the products in the line, the 32-inch HP 32 display, received mixed reviews despite having premium features. But after a lot of feedback regarding the size and the lacking resolution, the company has announced an improved but slightly smaller offering in the HP Envy 27 4k. It is indeed nice to know that there are still big businesses who listen to their fans and consumers in this day and age. The new model features a higher 3840 x 2160 resolution in a 27-inch screen size, the denser pixels in this product offers a substantially improved viewing experience versus the previous model which only had 1440p. Another big update to this latest product is the inclusion of a USB Type-C port, which enables another set of options in usage, further cementing this monitor’s listed improvements over its predecessor. At a glance, the HP Envy 27 4K looks physically amazing. The bezels are only 6mm thin, and when viewing the gorgeous 27-inch display, they are quite unnoticeable. The display itself only measures a slim 15mm, so on a dimensional standpoint, this product fits the design standards of the market it targets. The cabinet has a clean matte black finish and texture, and there are no accents or extras to be seen from the front to the back aside from the essentials. Aside from the image specifications of the panel. It is also covered with a protective anti-glare coat which HP calls the Advanced Haze surface treatment. Against the brightness and the resolution, it is unnoticeable, and it does get the job done. The redesign also has removed the speakers from the side, of the bezel, further setting the Envy series from the Spectre line, another popular product series from HP. Another distinguishable redesign from the predecessor is the stand for the Envy 27. From a dual post design, this year’s model has a single, chrome finished post connected to a discrete square base. HP states that this scheme was employed to create an illusion that the display floats by itself. The chrome finish helps to achieve this effect, but even if it is visible, it still is elegant and beautifully minimal. One downside of using this type of stand is it lacks any point of articulation. Adding ergonomic mechanisms to the product may seem detrimental to the overall look HP emphasizes on the Envy 27, and in my humble opinion, the monitor exudes a level of flair making it suitable to be placed as a centerpiece rather than a productivity item. On the rear side of the cabinet, you won’t see a lot of things going on, but one of the exciting updates on this model can is found here. HP includes a limited range of signal input options for this product, so they only built two HDMI ports (one 2.0 and one 1.4), a DisplayPort and of course, the USB Type-C port. This receptacle is capable of handling data transmission and power, so ideally this monitor is compatible as a dock and external display for your Macbook Air 2016 or Google Chromebook 2016, which are both ultrabooks which exclusively rely on USB-C to charge and exchange signal and data with other devices. This addition is an early attempt at future-proofing by HP, and it is quite a welcome feature to have at a time when the market is currently adjusting to adopt the tech as the new universal standard for connecting devices. The HP Envy 27 features a27-inch IPS panel with LED backlighting and capable of 4k resolution at 60hz. In our observation, 4K seems to be the unmentioned standard for most of the USB-C compatible monitors today since Apple, one of the early adaptors, emphasizes on quality imaging and clarity especially when you put into consideration their Retina displays. 4k 60hz is doable using the DisplayPort, but if you are streaming from a device such as a Macbook Air, the USB-C interface also allows this output spec via a single Type-C cable. Our first impressions also suggest that the product is capable of great color and contrast performance, as HP advertises a near perfect coverage of the sRGB color space. Most of the other specific details are still hidden from the consumers, so more information about the real world performance will be updated with this preview. 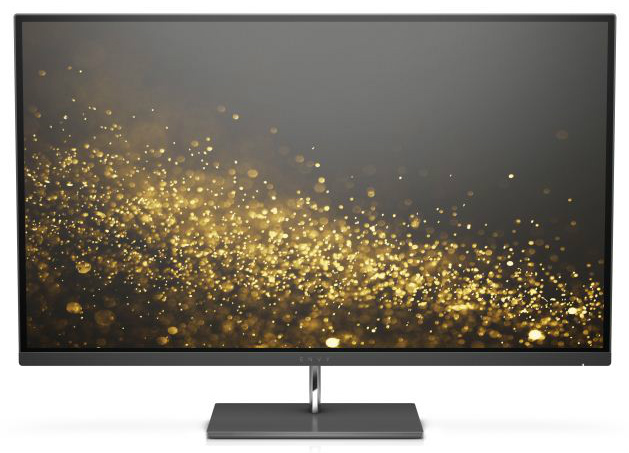 Aside from the dazzling inclusions in the product, HP has also built Freesync compatibility into this monitor. This inclusion is quite a useful feature since most systems will be hard-pressed to produce a constant 60hz at 4k. Judging from the signal input options in the device, the Envy 27 is primarily for regular desktop use instead of the mentioned Type-C usage above. Freesync has limited application capabilities with the latter since most of the current mobile devices using the standard do not have a lot of horsepower in their innards to play games at 4K. Most of these devices are designed to be portable, thin and energy efficient, so most if not all, do not carry AMD Radeon graphic processors. The IGPs from Intel processors are compatible, but they not powerful enough to play games which will have frame rates in the range of Freesync utilization. While there is a limited set of information we can provide in this article, we can say that the HP Envy 27 4K is shaping up to be one of the top competitors in the mixed-use 4K market. Their inclusion of USB-Type C into their signal input options places them in a newer category we might see soon enough, so getting one for your home or office is a good idea. Having a device with a certain level of future-proofing is highly ideal since the digital age keeps the market in a constantly evolving and improving status. The physical design of this product does not shy away from modern ambiances, so the Envy 27 is quite suitable to represent itself as a centerpiece of your desk both in the office and in a beautiful home. HP also sets an affordable price of around $499, making this offering competitive in the 4K arena. The Envy 27 starts to ship by the first week of December, so getting one for the holidays is a good idea. Isn’t the macOS UI set on standard Retina (logical definition of 1920 × 1080 pixels) displayed too big on this screen? If so, what are the settings offered for HiDPI scaled resolution with this screen? What are the logical resolution “more space”. When you try it, is the macOS UI at the right size, and isn’t it too blurry? These are the most important questions for a Mac user. Hi, Julien! Yes, the objects would seem slightly upsized and blurry or softened when viewed on this screen. Unfortunately, we did not get a chance to play around with scaling and tweaking settings for scaling during our short time with this monitor. I have a question for you. I have the 2006 Imac 27inch screen with thunderbolt ports. Would this work next to my iMac or will I need to consider purchasing something else. Also another question. Could I use this as a TV screen whilst still remaining connected to said IMac? Just really like the way HP have made there products look and would I think it would be a great choice of screen to have, just need professional opinion. Hello Miah, you can use a Thunderbolt 2 to USB-C adapter to connect your iMac to this monitor, however, we cannot guarantee that it will work without any issues. You can also use this monitor as a TV, but there will be no sound since this model doesn’t have built-in speakers. (not using an adapter (e.g., USB-C to HDMI or DisplayPort))? plugin that cause the problem). Hi, Stan! The HP Envy 27 should be compatible with the latest MacBook Pros with USB-C, but there are some reports from users who experience the same issue. We suspect this is an early-release bug of USB-C monitors, and it should be ironed out soon. What is the “advanced haze” treatment? Is this a matte or gloss finish? Or something in-between? Hi, Olen! Thank you for reading our review. Normally, HP products come in three coating options, but the Envy 27 only comes with the advanced haze treatment, which sits in between glossy and matte. To describe it, it kinda looks like a non-polished gloss finish. This monitor is not compatible with a new 15″ MBP w/touchbar. When I ordered it a month ago HPs site stated support for Mac but has since removed that information. Upon connecting my MBP to the screen with HP’s supplied USB-C cable I get an error stating that an unsupported cable is connected, no signal is found or the device attached is requesting more power than the display can provide. After various unplugging, and power cycling of the monitor, it occasionally works as it should. HP tech support will not assist with Mac products without using the paid support service. Frustrating experience that resulted in an RMA instead of HP providing tech support for their product. Hi MJ, we are sorry to hear this problem. Have you tried other USB-C cables? This issue could be a defect on either the cable or the USB-C ports on your devices, most probably on the Envy 27’s end. We hope you can resolve this, and please let us know if your RMA results in anything positive. USB-C is still new to the industry, so it may take manufacturers some time to perfect inter-device compatibility. I have the same issue. USB-C not working. Got it to work once I manually selected USB-C using the buttons on the back of the Monitor. It works but when I plug in USBC it says the cable is cont compatible. Hello, Bob! If you are willing, try to use a different USB-C cable from reputable brands like Belkin. We’ve heard that some users enjoyed success in using the USB-C slot using an aftermarket cable. This sentence is slightly incorrect as MacBook Air’s don’t have USB-C ports to connect to this monitor’s USB-C port. To this monitor via USB-c it will both charge my laptop send signal to the display. Does that mean I can use the monitors USB type A to connect to my laptop? The new MacBook Pro 13″ uses a 61-watt USB-C power adapter, the 15″ model uses 87-watt. This HP Envy 27 monitor outputs up to 60 watts of power over USB-C so it can charge the 13″ but probably not the 15″ which it may be able to power but not charge. This monitor does not have a USB-A port. Connections are USB-C, HDMI 1.4, HDMI 2.0, and DisplayPort 1.2. If you have a new MacBook Pro 13″, use one of its USB-C ports to connect to this monitor for charging and display. If you have a new MacBook Pro 15″. use one of its USB-C ports to connect to this monitor for display but not charging. Why would you transfer data via the USC-c cable – and consequently how can it be used as a hub – when there is no other data input on the monitor (e.g. a USB port)? The only benefit of USB-c on this monitor is to both charge your laptop and output video with a single cable. Unfortunately you cannot use it for data transfer also, which makes it a bit useless for Macbook (not Pro) owners, since these only have one port on the laptop. Hi, Nick! Thank you for taking the time to comment. Thank you for pointing that unfortunate flaw out. USB Type-C is capable of three things at once, providing power, transferring data, and transmitting signals. 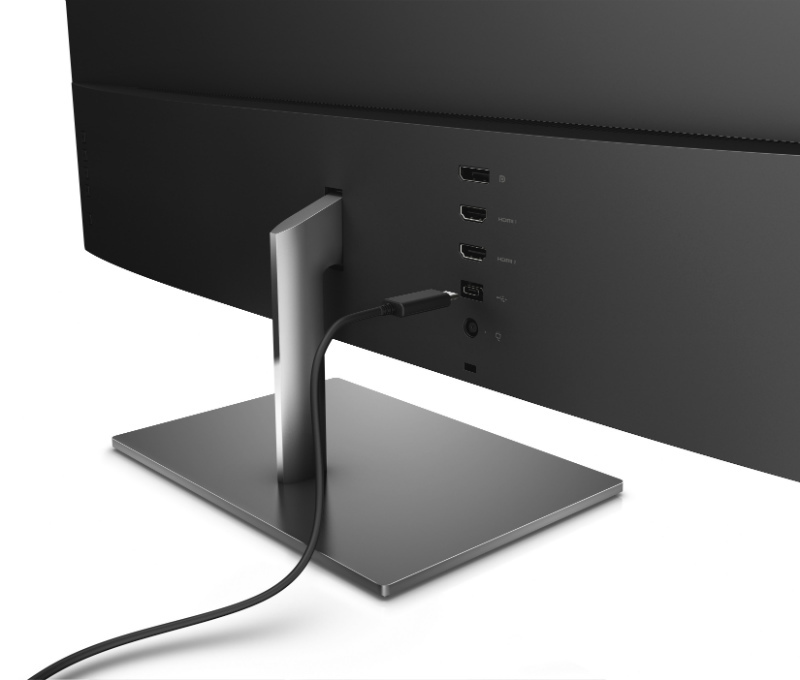 You are correct about the limitation of having a single slot on the Macbook and this monitor, but there are available solutions such as external hubs which will connect to the Envy’s USB-C slot, and provide other connection options. For example: (https://www.moshi.com/usb-c-multiport-adapter). It’s an additional cost to owners of these types of gadgets, but these companies are doing business. The technology is still young and isn’t integrated into every common device we currently have, so the companies are still exploiting limitations to make external solutions for consumers to buy. Don’t worry, though; I’m sure that this feature will mature soon, so designers and manufacturers will get things right. The HP Envy is part of the first generation of these monitors, and as will all pioneering stuff, there will always be flaws and limitations. Are you sure that hubs such as that one (and Apple’s multiport USB-C adapter, for example), can be used in this way? They are intended to be used as a hub connected to a laptop, so I’m not convinced that plugged into this monitor its USB port could be used to transfer data back in and out of the USB-C port to the laptop. Furthermore, I don’t suppose you have any idea when this mobitor will go on sale in the UK? Your Amazon link does not lead to this new monitor. If it is supposed to be available now, where is it available? This monitor is not available for purchase yet.